One year old & 10,000 readers. Dear God, how did that happen? oneweekinaugust.com is celebrating over 10,000 readers. Had you asked me 18 months ago if I could imagine myself writing this sort of blog, with a Bible app on my phone, an aural affection for the Pandora ‘Songs of Worship’ channel, that I would have been Lipton’d and be working with a global charity broadcasting the gospel to a few billion people in the hardest-to-reach parts of the world? I’d have checked if the person you knew was the same one whose mind and body I inhabit. As my recent run in with the horned mother trucker tested, this blog is not an ego-feeder of readership numbers, shares and likes. It isn’t. Honestly. And yet.. When Jesus told them the Great Commission, his first century disciples didn’t have the benefit of digital media, social sharing and blogging immediacy. When the resurrected Jesus called his followers to baptise all nations in the name of the Father, the Son, and the Holy Spirit, there was no internet. No bible colleges and theology degrees. Simply Jesus’ disciples, blessed with the holy spirit, getting out there on foot and letting as many as possible know. Today it’s all shifted. Ministering and disciple-making is seen as the domain of those who have studied up – with the correct certificate hanging on the wall, and the right stole and cassock hanging in the wardrobe. Which I wasn’t aware of when I started this blog. Too new, too fresh and too oblivious to ‘right’ procedure. Back then, surprised by G, J and the SAP (smart alec pastor), I simply wrote what I observed during my slightly madcap Christian journey. It kicked-off partly as a way to process, partly as a means to ‘come out’ to my atheist friends. But it has grown…into I’m not sure what. A kind reader sent me am encouraging note after my mother trucker blog: I think anyone who sticks their head up in the trenches like you do, will get shot at by the Evil One.. no surprises. The surprise is the WAY he does it..the bullets he uses, tailored to impact just you. It’s happened to any of us who use our gifts to further the Kingdom. I’m not sticking my head up, I’m hiding behind a keyboard here aren’t I? Further the Kingdom? Dear Lord, I hope you’ve got some seriously good roadsigns up for people. I do head off-piste…sorry.. Yet, I can’t ignore the numbers. It must make enough pithy sense for people to be engaged. So, completely accidentally, this has become a ‘baptism by blogging’. Digitally dunking as many readers as possible into a river of words, thoughts and my take on modern-day discipleship. Trouble is, that’s all a bit radical to many in the modern day church. But for the early believers, that was normal. It was what you did once you had hung around with a grace-filled, other-focused man who taught a radical new way to live, performed miracles, was persecuted, crucified and CAME BACK TO LIFE. To those early believers, it was normal Christianity. And these men and women—empowered and motivated by the Holy Spirit—turned their world upside down for the sake of Christ. In short, they were true disciples. They followed. They believed. I’m a fairly dodgy disciple. I fail daily at being Christ-like and other focused. I imagine him peeking out at me from behind his fingers, shaking his head, looking to his left and saying, “Dad, she really didn’t just say that, did she..? Oh..yes, yes she did… Hang on, I’ve got it.” And he leans forward and whispers grace in my ear. It is those odd whispers that form these blogs. I have to write to pick over the raw gems that God shoves at me. Mostly, it’s an almost physical compulsion to have another go at explaining what too much church and too much religion has lost in translation. My way of gently unpacking the joy that I never expected, the awe that keeps me thankful, and the fun and humour I have in a relationship with G&J. I don’t think I’ll ever be the “OMG, you should meet this bloke!” yelling type. 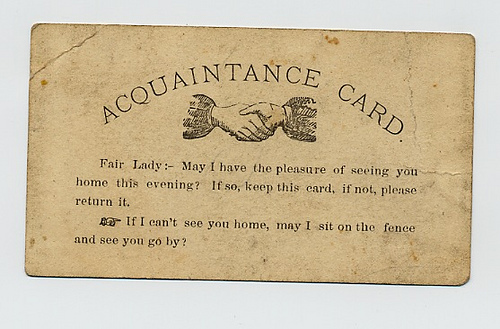 Instead, I prefer to think of these blog posts as a modern take on 18th century calling cards. A basis of forging an introduction. Bless you for reading and sharing. Hi Philippa, whichever way you cut it and whatever the motivation, that’s a lot of people. I know I find sticking my head up above the parapet (keyboard held up in defense or not) is downright terrifying……however it’s when you’re the most impactful :).